﻿ How to Watch iTunes Movies on Android? 4 Ways Here! How to Watch iTunes Movies on Android? 4 Ways Here! Why iTunes movies can't be played on Android tablet? That's mainly because your purchased iTunes M4V files are encrypted by DRM technology called FairPlay, which is designed to protect iTunes DRM M4V files being copied to other non-Apple products. So the for Android users, how to play an iTunes M4V movie on Android comes critical. Facing this question, here are 4 efficient ways for you to watch iTunes movies on Android. MacX MediaTrans is a newly 2-in-1 program for iTunes DRM protected movies transferring and DRM decrypting. You can remove iTunes DRM and convert M4V to MP4 as you transfer iTunes encrypted movies from iPhone iPad to Mac/Windows so as to watch on Android phones and tablets later. Besides iTunes M4V movies DRM removal, this program can also be treated as an alternative to iTunes for transferring data (photo, music, movies, ebook, voice memo etc.) between iPhone iPad iPod and Mac computers. In similar case, the Windows version - WinX MediaTrans empowers you to get data transmission between iOS and Windows. Prior to iTunes DRM removal, you need to free download iTunes DRM removal software on Mac, or Windows version on Windows PCs first. Step 1: Plug in your iPhone iPad to Mac/Windows computer by a USB cable. Follow the prompt to set your iTunes in case of any data loss. Step 2: Choose iTunes DRM M4V movies. Click Video icon on the main interface to enter the video transfer window and select the iTunes DRM protected M4V movies, TV shows, or music videos. Tick the white box or just choose "Select All". Step 3: Press "Export" button and the iPhone iTunes DRM M4V video will be automatically converted to MP4 video without DRM protection and transferred from iPhone to Mac/Windows computer. Step 4: Then you can stream the MP4 iTunes movies to Android by USB cable, email sending, uploading to Google Play or whatever. The M4V format make it impossible to watch iTunes movies on Android directly. So if you can convert the DRM protected M4V to common MP4, AVI formats, the issue about playing iTunes encrypted movies on Android will be solved smoothly. 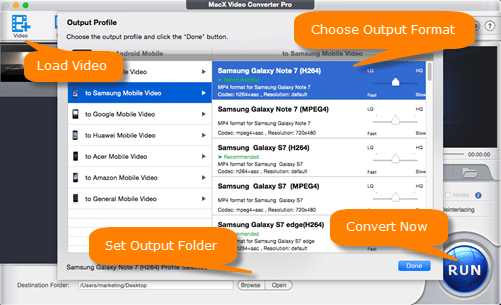 MacX Video Converter Pro is such a video converter specially for converting iTunes movies into Android accepted formats like MP4, AVI, 3GP for playback not only on iPhone iPad but also Android tablets/phones, Windows RT tablets, PSP, Zune, Kindle Fire, etc. Step 1: Free download the iTunes video converter on Windows or Mac version on Macbook Pro/Air, iMac etc. Then click "+Video" to load iTunes purchased movies saved in your computer. Step 2: Choose output format. This M4V converter on Mac and Windows not only allows you to convert M4V to MP4, AVI, 3GP, WMV, but also VOB to MP4, MKV to AVI, WebM to FLV, AVI to MP4 etc. Step 3: Click "Browse" button to specify output folder path. And then hit "RUN" icon to start converting iTunes DRM movies to Android. Then you can transfer the movies to your Android device to watch them. Recording a video from iTunes to formats compatible with Android is also possible to play an iTunes M4V movie on Android. And an excellent screen recorder for Mac and Windows is quite essential. Luckily, Bandicam is precisely competent enough to record iTunes movies, including new movies on iTunes, with audio and remove iTunes DRM. 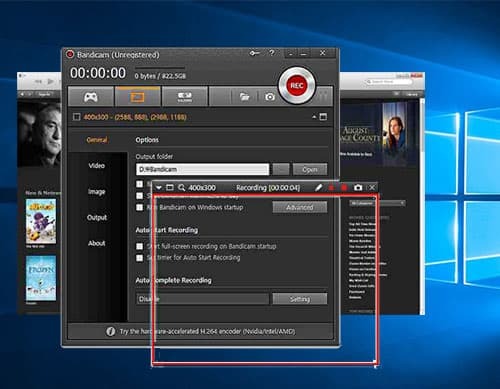 Step 1: Download and insatll Bandicam on your PC, then start by switching to 'Screen Recording' mode. The rectangle window will pop up, and you can move and resize the rectangle window. Step 2: Adjust the green-edged rectangle on the video and play the iTunes video. Step 3: Click the '● REC' button or press the 'F12' function key, then your iTunes M4V movie will start recording and the iTunes M4V DRM will be removed smoothly. Step 4: To stop recording, click the 'Stop (■)' button (Hotkey F12). Finally, ti watch the recorded file, click the 'Open' button under the 'General' tab of Bandicam. Note: The iTunes screen recorder is only available on Windows platform, so if you'd like to remove iTunes movies DRM on Mac, you can search for another Mac screen recorder or switch to Method 1 or 2. You can manually move your iTunes movies to your Android device if you want. Though the procedures are very tedious, especially if only a couple of specific tracks are required, you can know how get the thing done for finally watching iTunes purchased movies on Android phones and tablets . Step 1: Connect your Android device with your PC and take your device to the Mass Storage USB Mode. Step 3: Be confirmed that in iTunes Media Folder, iTunes files are copied. 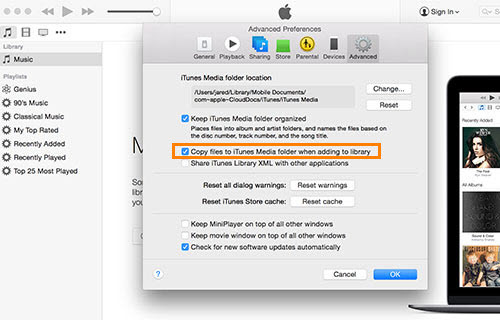 Explore iTunes and follow Edit > Advanced option and then mark the option "Copy files to iTunes Media Folder when adding to library". Step 5: Finally paste the files on your Android phone or tablet's specific folder after copying from iTunes. All these four methods can move iTunes M4V movies to Android for watching without any hitch. The difference only lies in the process of iTunes purchased movies transferring. For me, #Method 1 is preferred since it remove iTunes DRM, convert iTunes protected movies M4V to MP4, and transfer iTunes purchased movies to Mac/Windows computer, at one fell swoop several. Of course, you can pick the your best fitting one to finally watch iTunes movies on Android. Best iTunes DRM removal tool to remove iTunes M4V DRM, convert M4V to MP4 and transfer iTunes purchased M4V movies to Mac/Windows computer for finally watching on Android phone and tablets.